I catch myself holding my breath… again. I haven’t blinked in a couple of minutes and sweat has begun to bead across my upper lip. My fingers are motionless on the keyboard. My body is frozen. Now, really. This shouldn’t be so hard. What if it’s no good? Wait. That’s not exactly right. What if it’s not the best? Yeah, that’s my real fear. It’s not failure. My fear is mediocrity. I’m learning to write. It has occurred to me that as long as I draw breath and my fingers continue to click across the keyboard I will still be learning to write. That’s fine with me. I love to learn. But I want to keep my learning in a safe environment. I shrink from risk-taking. So, if an assignment requiring any risk is optional, I simply won’t accept it. I know, it’s the cowardly way. But like I said, I’m not a born risk-taker. I continue to stare at the words on my screen. Those words in bold, red print. The assignment is part of an online training community, COMPEL, that I joined a few months ago. I’ve seen these assignments before. I’ve even completed them before… in my head. No risk there. I’m the only one who sees what I’ve done. But, now I know it’s time to move on. It’s time to accept my assignment. It’s time to take the risk. I wish I could say that these writing assignments are the only ones I’ve declined because of the risk involved. Unfortunately, that’s not the case. Mediocrity isn’t the only fear that keeps me from accepting assignments. There’s the fear of accountability. Accepting an assignment holds me accountable. Accountability to someone on the other end of a computer connection hundreds of miles away is one thing. 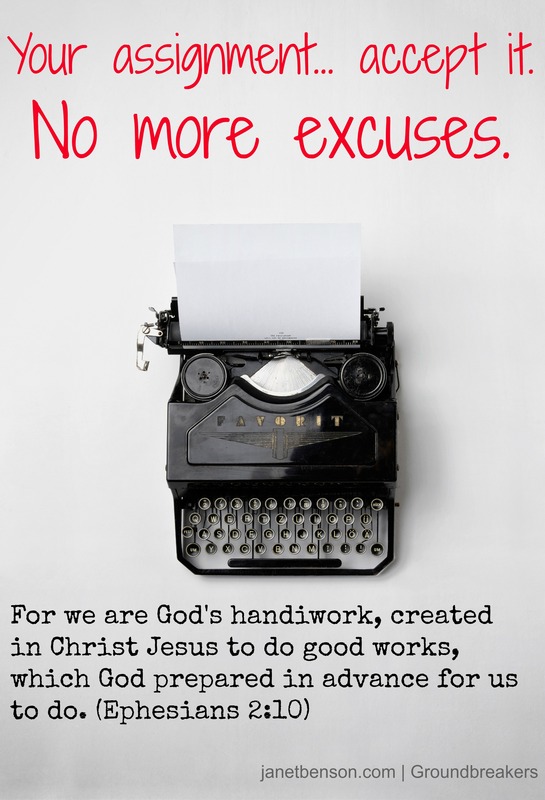 Accountability to God is quite another. As I read along with the Scripture in our sermon last Sunday morning I saw a familiar passage in a completely new way. I saw three men who had been given an assignment and who had failed. I saw why they failed, and I saw how they responded. They went to a place called Gethsemane, and Jesus said to His disciples, “Sit here while I pray.” He took Peter, James and John along with Him, and He began to be deeply distressed and troubled. “My soul is overwhelmed with sorrow to the point of death,” He said to them. Stay here and keep watch. They did not know what to say to Him. What would I have said? Looking straight into the sorrowful, distressed eyes of Christ, who had asked nothing more of me than to keep watch for Him, what would I have said? Why did they fail this assignment? They were exhausted. They had been travelling with Jesus, busy with the activities of Holy Week. They had fallen asleep because they were simply worn out. Simply worn out. I’ve said those words to God before. I can’t accept this assignment from You, God, because I’m simply worn out. I’m tired because I’ve been involved with doing so many holy activities for You. I’ve been travelling down this road that I’m sure Jesus is on with me, and I’ve been going non-stop. I’m just too tired to do this thing for You. When I stop and think about it, though, I haven’t really felt the presence of Christ with me on the road I’ve been travelling. Somewhere along the way I got off track. I got so impressed with all my “doings” that I didn’t notice when Jesus took a different path… a path He expected me to follow along with Him. Those three disciples at least knew better than to make excuses to Jesus. At least they had the sense to keep their mouths shut. At least they recognized how they had failed their Teacher. They knew better than to add insult to injury. I wish I knew better. But, you know what? Before Jesus ever gave those three their assignments, He knew they would fail. Not once, but three times. The first time He told them to keep watch. The second time He told them watch and pray. He told them to pray so they wouldn’t fall into temptation. He gave them the recipe for succeeding in their assignment, because He knew their limitations. He knew they were only human. He knew they were simply worn out. Here’s the part that gives my soul sweet relief. He doesn’t write me off when I fail my assignment. He doesn’t leave me behind when my results are mediocre. Those three who seemed to have failed so miserably at their divine assignment, three times, weren’t left behind with a giant “F” on their spiritual report card. Not even a “C”. Jesus shook them out of their state of failure with one word. He encouraged them to keep pressing on with one word. Then, with three beautiful words He invited them to continue along with Him. Let us go! Exclamation point! Notice the word right smack in the middle of that sentence. Us. He doesn’t tell me to go on and give it another shot. He tells me He’s going with me. He tells me there will be another assignment waiting for me. And He doesn’t ask if I’m ready. He knows I am, because He has equipped me and He will empower me. I’ll put aside my fear of mediocrity. I’ll lay my fear of accountability on the altar at the feet of the Father. I’ll hold fast to the fact that there is no risk too great to take for the One who gave His life for me. I’ll accept the assignment. Because really… there are no more excuses. I love this, Janet. No more excuses. Keep writing, sister! With God all things are possible, even the most difficult assignments. Thank you, Suzie! Our God is powerful! Thank you Tayrina. And thank you for your encouragement! Thank you for your kind words of encouragement Kim. This community has truly been a gift from God, providing me with more than I could ever have imagined in the way of teaching, support and encouragement to go forth boldly in faith. “I got so impressed with all my “doings” that I didn’t notice when Jesus took a different path… a path He expected me to follow along with Him.”…… guilty! This was a beautiful post, Janet; thank you for sharing in honesty! I too, have suffered from fear of mediocrity; there are many excuses that come along with this ugly disease. And I’m with you… ENOUGH! Keep writing… you’re doing a PHENOMENAL job! Thank you for such kind, encouraging words, Crystal! I’m looking forward to reading your posts!